Since starting NOLYB a little over three years ago, I've experienced so much. I've met loads of interesting, and amazing people. I've learned a lot about life, the music business, and even myself while making my way through the houses, clubs, and bars of Upstate South Carolina. I wanted to give the often unheard artists of this area a platform to tell their stories, and share their music. When I started, I had no idea that I'd watch this area grow as a community of artists, and wind up growing as a person right along with it. It's truly been a great experience. Now, it's my turn to give back. As my way of showing appreciation to you for supporting NOLYB, (and in turn, independent music) I'm giving away a bunch of stuff! 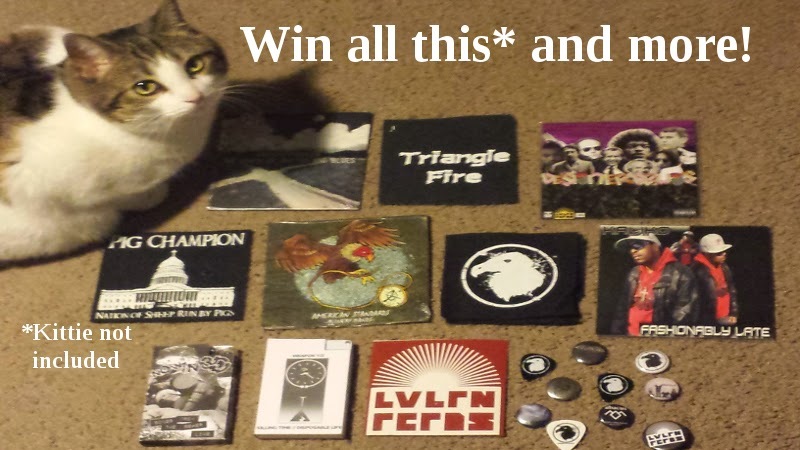 One lucky winner will receive an assortment of CDs, Tapes, Patches, Buttons, Stickers, and more! Everything pictured above is only part of what you'll get in this prize pack because new stuff is being added even as you read this! There's so much stuff in it, I'm honestly a little worried about the shipping cost! All you have to do to win this big, beautiful box of music swag is tell me why I should give it to you! My favorite response wins, and yes, it really is that simple. It's so easy, it's actually kinda hard! You've got to be creative though, so no Facebook posts saying "uh... I like music... and I want free stuff" because that isn't gonna work. Make me laugh, make me cry, make me question my entire purpose; whatever you do, just be creative! Make a video, write a short story, a song, a poem, or just send a funny email. Seriously, send your response in any way you want. The key to winning is creativity, the only restriction is your own imagination. Send me a singing telegram if you can manage, I really don't care how you respond. Just tell me why I should give you this box of stuff in the most creative way you can think of, and if I enjoy your response the most, you win. The winner will be announced on NOLYB Episode 100 coming Saturday, February 14th! Get your responses to me no later than February 12th. (That gives you four weeks.) Send your response via Facebook, Twitter, Instagram, email, YouTube video, carrier pigeon, St. Bernard, remote-controlled helicopter... whatever! Yes, presentation does count, but this really boils down to whoever gets the biggest reaction out of me. I'm really looking forward to your responses, I'm sure they'll be great. Best of luck to you all, and have fun!